Add Another Tool To Your Business! 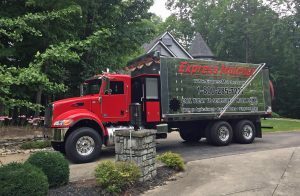 The Express Mulcher™ is designed to haul and spread large quantities of processed mulches, wood chips, and lightweight compost. Used properly and with the appropriate materials, it can blow up to 60 cubic yards an hour. It makes a great entry-level machine into the blower truck market for those starting out in the landscape mulching, playground chips, animal bedding, mud control, or filling sediment control filter sock.. It’s not for aggregates, Terraseeding, rooftop gardens, or heavier soil blends, but it is a great addition to an already existing blower truck business. Whether you are looking for an economical way to get into the mulch blowing business or simply want to augment an already existing one, the Express Mulcher is your solution. What Makes the Express Mulcher Different? 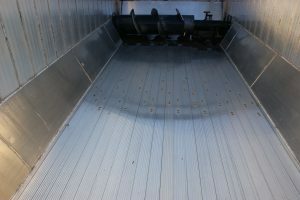 Hallco LIVE FLOOR® that feeds material forward towards the cab and reverses for bulk offloading. Box area includes a remote load camera. 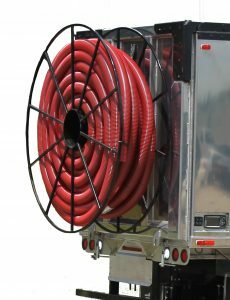 The Hydraulic Hose Reel holds 300′ of 4-inch blower hose. Plus, it is both 4-inch and 5-inch hose compatible and comes standard with 4-inch Express Blower® proprietary hose. Plus, the optional Creep Drive feature let’s you blow and go! Call and talk to us, so we can spec the machine that’s right for you. We’ll send you a quote. Simply sign it, and then submit a 10% deposit. That’s it. No progress payments. No excessive delays. No worries. Plus, it is backed by the Express Blower® warranty, and our knowledgeable customer support team is here for parts and technical assistance after the sale. Call us today to see if the Express Mulcher is right for your business. 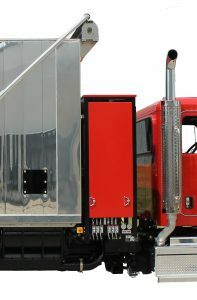 **Actual carrying capacity is variable and depends on cubic yard weight of materials; truck/trailer axle configurations; and Federal, State, Local truck/trailer weight limit regulations and laws. Owners and operators are responsible for loading and operating vehicle in compliance with Federal, State, and Local rules and regulations. Express Blower machines are designed for maximum performance and output. Performance may vary depending on type and quality of material used, operator proficiency, and job site requirements and specifications. Due to the size and weight of an Express Mulcher, a Class B Commercial Driver’s License is federally required to drive the unit. You don’t need more people … you need more machine! Design® logos are registered trademarks of Express Blower, Inc. Copyright 2016 - Express Blower. All Rights Reserved.